Musician Phil Collins recently donated his collection of artifacts from the Texas Revolution to the General Land Office. If you missed the big press conference where the lead singer of Genesis and Land Commissioner Jerry Patterson hug it out in front of the Alamo, you can watch it here. Looking for a laugh? Check out Texas Monthly’s “Meanwhile in Texas…” where you can read about some of the craziest things that have happened in the state over the last 30 days. A cross-dressing mini-skirt arsonist? You can’t make this stuff up! 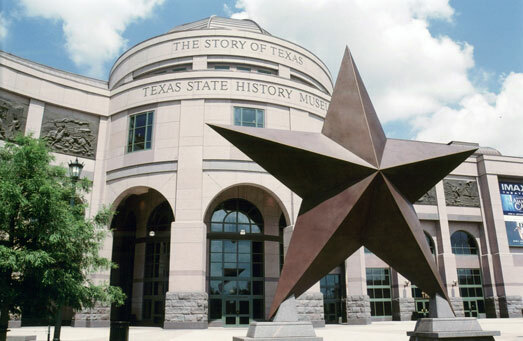 The Bullock Texas State History Museum tells the “Story of Texas” to its millions of visitors through three floors of interactive exhibits, special-effects films, and an IMAX theatre. And because everything is bigger in Texas, a 35-foot-tall bronze star sculpture greets visitors by the entrance. 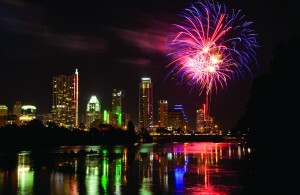 Every Friday in July, you can catch a live music concert under the star.